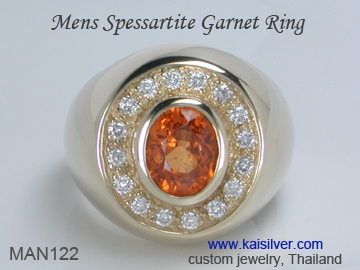 Kaisilver has been a pioneer in the development and crafting of high end rings for men. By giving equal importance to impressive looks and durability, we have raised the level of men's rings. Many other jewelers are still trying to achieve the quality standards that we have set. When you order a men's custom gold or sterling silver ring from us, you are not restricted to any fixed set of designs or gemstones. Expert artisans work on each men's ring, highly skilled gem cutters custom cut every gem that we use. Quality check procedures are stringently applied all through the production process, this ensures that your men's made to order ring provides good value for the money you spend. Custom made men's rings can be ordered in 14k or 18k gold and 925 sterling silver. The same quality standards are maintained for gold and 925 silver men's rings. Your men's ring can be crafted with your design or ours, we place no design restrictions. 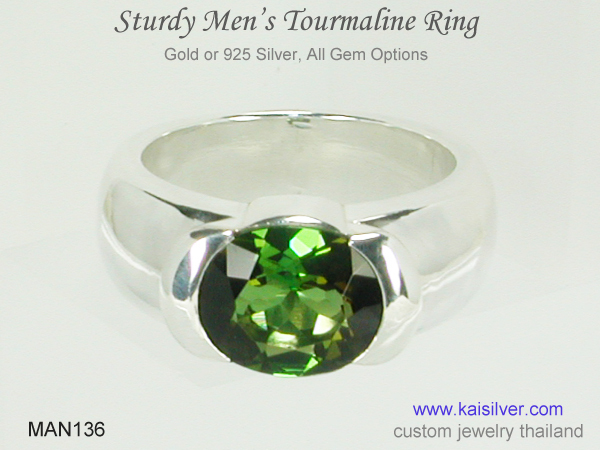 We can provide just about any gemstone that you require for your custom men's ring. Since every gold or silver men's ring is made to order, you can specify the size that you require. We work to deliver good looking rings that, have built-in features to enhance durability. Our rings generally have 40% to 50% more metal weight as compared what other jewelers provide. Every custom men's ring in gold or silver, passes through strict quality control checks. Page 1 Page 2 Page 3 . A sturdy and durable men's sapphire ring with diamonds. Available in all ring size, you can order this sapphire gemstone ring in gold or 925 sterling silver. Read all about the options for this awesome men's ring ... here. 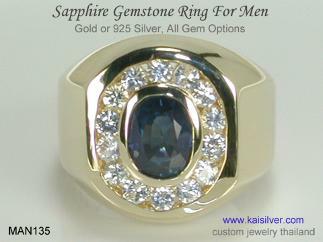 A handsome Kaisilver men's ring, a sturdy gold or 925 sterling silver ring for men with a tanzanite gemstone in the center. The diamonds on either side of the center gemstone can be replaced with gems of your choice ... more. 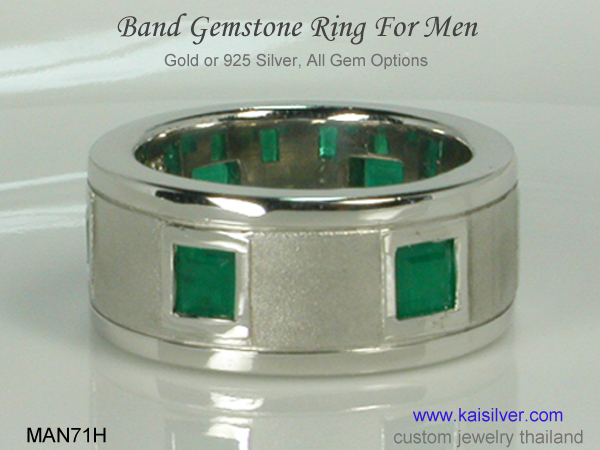 While you focus on good looks, metal and gems, the experts at Kaisilver work behind the scenes to ensure that your men's band ring is durable to last for a very long time. Learn about the researched features incorporated into our rings for men ... more. The four century old claddagh ring is widely regarded as the most meaningful jewel in history. 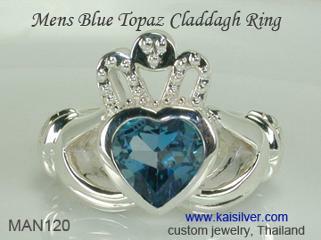 Kaisilver crafts gold and 925 sterlingsilver claddagh rings for men and ladies, learn more about this historic jewel ... here. Weighing around 25 grams, this green tourmaline ring is tough enough to keep pace with your hectic lifestyle. A large oval 11x9mm green tourmaline gemstone securely framed in a reliable gold or 925 silver ring, built to last ... more. Spessartite is one of the rarer varieties of garnet. This stunning spessartite and diamond ring is crafted by highly skilled artisans at Kaisilver. 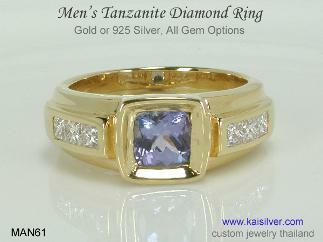 You can order this men's ring in 14k or 18k gold, it is also available in 925 sterling silver ... more. About Us: With more than 7,000 style and quality conscious gem and jewelry lovers across the globe proudly wearing gems and jewelry crafted by Kaisilver artisans, we are today the leading online provider for high end custom made jewelry. Custom made jewelry is made with designs and gems of your choice, you need not limit your selections to what is mentioned or shown on our websites. We are directly networked to most gem mining locations in the world, this gives us preferential access to the finest gems for each price point. Leading gem dealers open up more than 200 million carats of cut and polished gems for our selection. This gives us confidence to place absolutely no limitation on your choice of gems. Our high quality standards remain the same for both, gold and 925 silver made to order jewelry. You can email our support experts at sales@kaisilver.com with any queries or requirements that you might have.